Performance review: The financial sector has been competitive over the past five years, with the financial index returning an average of 14.81% a year against -2.44% for the resources index and 16.7% for the industrials index. Positive performances from Sanlam, Standard Bank and First Rand boosted the index. The Satrix Fini ETF returned an impressive 16.38% in the year to end-June, significantly outperforming the S&P Givi ETF which lost 0.74%. Over the five-year period the S&P Givi returned an average of 3.97% a year while the Satrix fund yielded 11.79% — which is significantly higher than annualised inflation of 5.45% over the same period. The noticeable differences in the historical performance of the ETFs is largely due to the different methodologies they use in selecting constituents. As such, the two funds have few constituents in common. For instance, they only have three common stocks in their top 10 holdings, with different weightings. 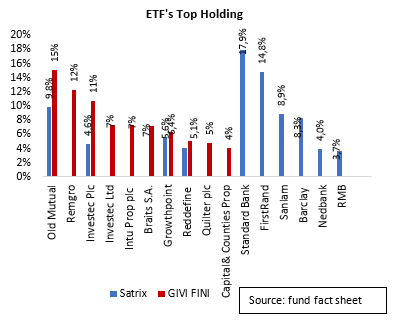 As reflected in the Top Holdings chart below, Standard, Sanlam and FirstRand are not in the S&P Givi’s top 10 holdings but are in the Satrix fund and this explains the large difference in performance. Both funds track the performance of the SA financial15 index – the 15 largest financial companies on the JSE. And the index only includes companies ranked 13th or above by investable market capitalisation. However, the Satrix Fini, which has historically been the better of the two, selects its constituents based on their market capitalisation. It invests in the 15 largest financial companies by market capitalisation. The attraction of this methodology is that it reflects market performance – because the fund is adjusted quarterly along with the benchmark, tracking error is minimal. 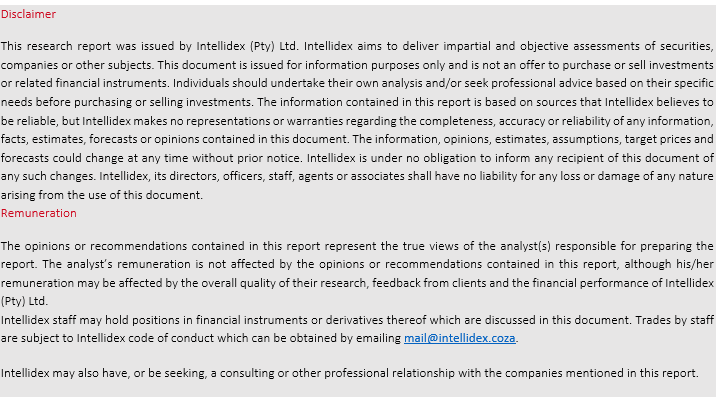 NewFunds S&P Givi financial 15, in contrast, selects its constituents based on what the fund manager believes is their “intrinsic value”, which is calculated from the financial indicators of the company. This is not directly linked to the share price performance of the constituents. The fund is adjusted every six months, and this might disadvantage it since the benchmark is adjusted quarterly. Both funds increase their exposures to stocks performing well at that time while avoiding those that are underperforming. The potential flaw though is that the methodology tends to increase its exposure in expensive stocks. Outlook: The performance of financial companies are closely tied to that of the general economy, and the outlook is rather bleak. National Treasury expects GDP growth of 1% this year, which is too low to inspire confidence, and 1.8% growth next year. Treasury says the domestic savings rate continues to drop due high inflation and a strong dependency on foreign inflows to fund investments. Top holdings: Both ETFs, focused on financial companies, lack diversification; most of their constituents are driven by similar variables and are likely to underperform at the same time. This diminishes the diversification benefits one usually obtains from ETFs. Suitability: These funds may undergo periods of high volatility and are suitable for long-term investors with an appetite for risk. Equities are known to grow ahead of inflation and other asset class over longer investment horizons, and both ETFs have managed to outperform inflation over five years. Risk: These are high-risk funds with over 90% of their holdings in equities. Financial companies tend to move in line with economic cycles, thus a decline in economic activity is likely to affect both funds negatively. Fees: The annual total expense ratio (TER) for the Satrix Fini is 0.41%, which is expensive compared with the Givi Fini at 0.23%. Exchange-traded funds (ETFs) are passively managed investment funds that track the performance of a basket of pre-determined assets. They are traded the same way as shares and the main difference is that whereas one share gives exposure to one company, an ETF gives exposure to numerous companies in a single transaction. ETFs can be traded through your broker in the same way as shares, say, on the Easy Equities platform. 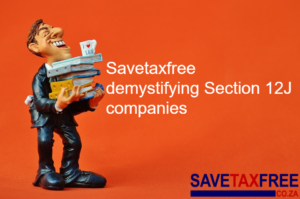 In addition, they qualify for the tax-free savings account, where both capital and income gains accumulate tax free.